The staff and students of Tarawera High School are immensely proud of their new facilities, following a $15.6 million redevelopment. 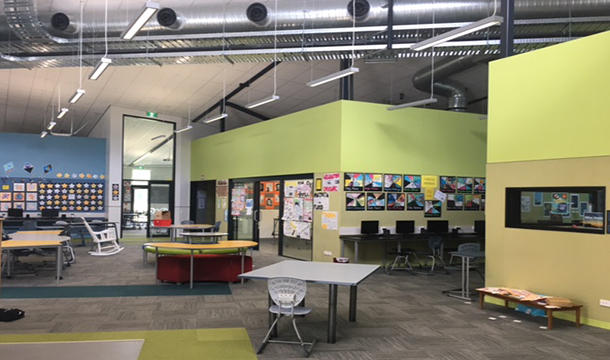 This project has contributed to the low decile School’s educational outcomes through the development of a new campus filled with Modern Learning Environments (MLEs). Most of the School’s previous buildings were old and had become severely dilapidated and leaky. 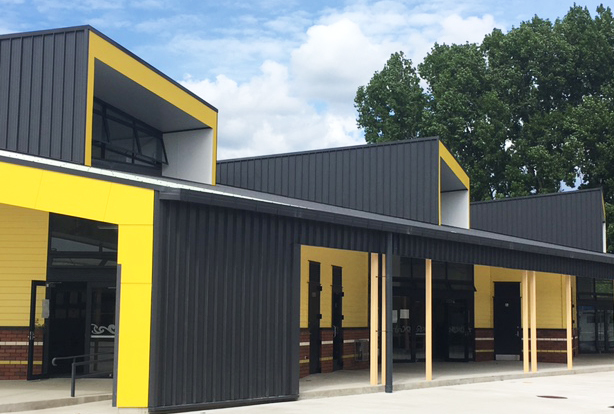 A refurbishment and extensive rebuild of the existing Kawerau College campus was undertaken to create advanced MLEs. These are now vibrant, well-connected learning spaces that take advantage of new building materials and technologies. 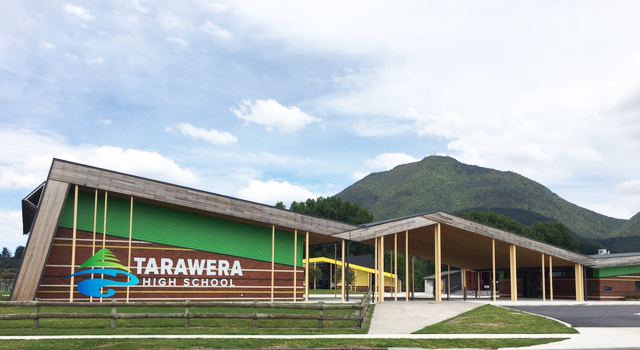 For architects RTA Studio, the goal was to create a school that engages with the unique landscape and history of Kawerau and its people. 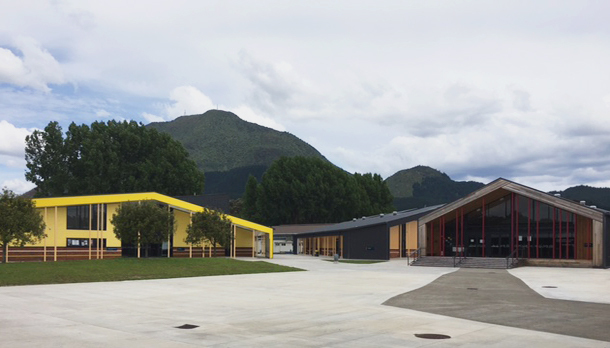 The school’s state of the art design was developed in consultation with the school, community and local iwi. At the School’s heart are four intersecting lines, running from the summit of Putauaki, the coast at Maketu where the first canoes landed, the mouth of the Tarawera River, and Kawerau’s town centre. Tarawera High School has both junior and senior sections, which have distinct identities but share specialist facilities and teaching expertise. Junior High educates pupils from 10-13 years old with student-centred inquiry programmes. Senior High helps 14-17 year olds along individual vocational pathways, with the goal that all students leave to go to further education, training or employment. The construction phase entailed building effectively 80% of a brand new school alongside an operational existing school campus. The community, staff and students were highly supportive during the build – with the project team working hard to minimise inconvenience over the course of the staged project, which took two years to complete. Project lead John Meredith has a proven track record with new school builds, enabling RDT Pacific to successfully open tender for the project. John assembled a team of consultants and subcontractors from Auckland, Rotorua, Whakatane and Tauranga: the geographic spread of the team made effective communication absolutely vital. A common requirement on school projects, and key to this project, was to educate the Principal regarding the design and construction processes and ongoing maintenance of school buildings. The upgraded facilities now comprise 33 new teaching spaces, a performing arts theatre and a hospitality suite. Flexible teaching and specialist teaching spaces can be used by both the school and local community. For example, the Whare and Hospitality and Performing Arts Blocks are separated by a large ātea space for welcoming guests and gathering the students and community together for special events. The school currently has a roll of 450 students from Years 7 to 13, with capacity for around 525. Reo Māori teacher Marissa Peters says the focus is not solely on the students but the entire community. She says, “It was the dream of the tribes and families here, to unite everyone when it comes to learning and education.” With the new school buildings and the academic success they are contributing to, it seems that dream has come true.